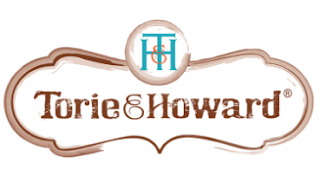 ThemeParkMama: New Torie & Howard Chewie Fruities! Organic/non GMO foods, are the way to go, and when it comes to candy it is hard to find, that meets both standards. Our family is a huge fan of Now and Later which is a soft chewy candy but it has a lot of dye and other things to give it is flavor and knowing how horrible I was when I was given red dye products I am sure it rubs off on my kids. 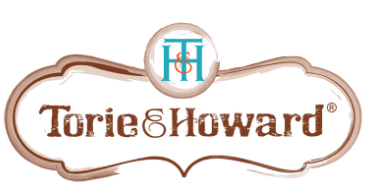 Thankfully Torie & Howard have now come out with the new Chewie Fruities. The candy is made in the USA, and flavors include: Italian Tarocco Blood Orange and Wildflower Honey, California Pomegranate and Sweet Freestone Nectarine, and Meyer Lemon and Raspberry. The Chewie Fruities are USDA organic and kosher certified and contain no GMOs, preservatives or artificial dyes. They also are free from major allergens, including soy, wheat, gluten, nuts, and dairy. So what did we think after trying the Chewie Fruities? The kids LOVE them, I think everyone's favorite is the Meyer Lemon and Raspberry. They are chewy like our other favorite candy, and I am SO super happy knowing they are organic and non GMO, and they are priced well at just $3.99 a bag! 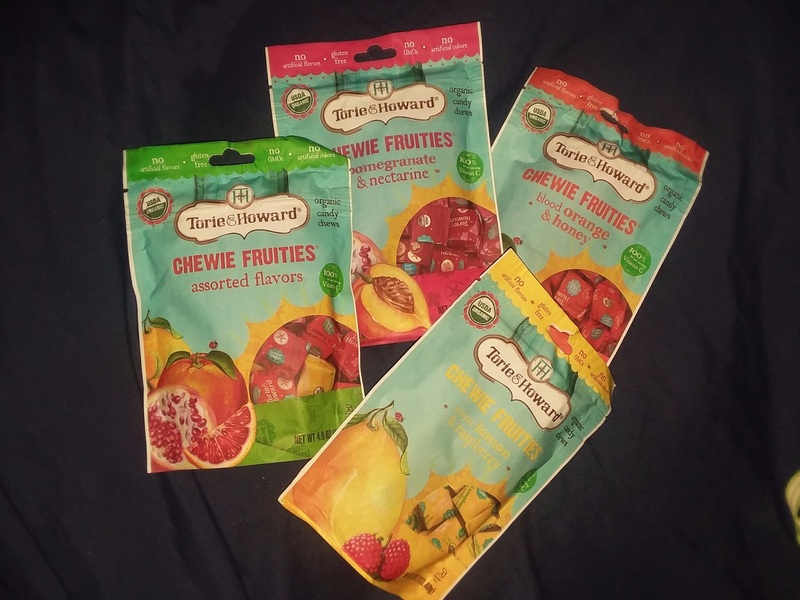 My kids and I tried these products and were pleasantly pleased at how great they tasted and they even seemed to last a little longer then are normal candies. 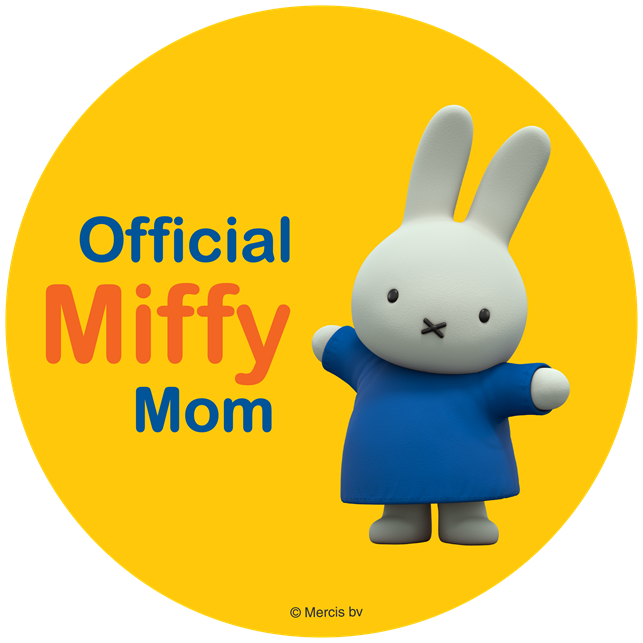 My kids each had their own personal favorite. Joshua and Elizabeth enjoyed the California Pomegranate and Michael really enjoyed the Italian Tarocco Blood Orange. The 2 others couldn't pick they enjoyed them all. 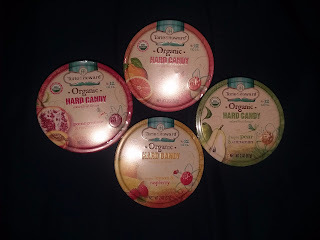 My personal favorite is the Pink Grapefruit and Tupelo Honey, which is ironic because I am not a huge fan of grapefruit pink or not, it always seems to sour but the hard candy has that perfect mixture that it is the best!